"Ray tracing the next week" is a follow-up to another mini-book by Shirley, "Ray tracing in one weekend" which was released only last month and covers the very basics of a ray tracer including ray-sphere intersection, path tracing of diffuse, metal and dielectric materials, anti-aliasing, positionable camera and depth-of-field. The Kindle edition is available for free when downloaded within the next five days (until 11 March). 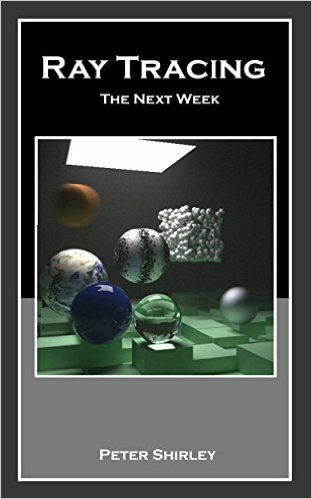 The book is excellent for people who quickly want to dive into coding a path tracer from scratch without being overwhelmed by theoretical details. It covers more advanced features such as solid textures, image textures, participating media, motion blur, instancing, and BVH acceleration structures and comes with source code snippets (using C plus classes and operator overloading, easily portable to CUDA). The code even contains some simple but clever optimisation tricks which are not published in any other ray tracing books.